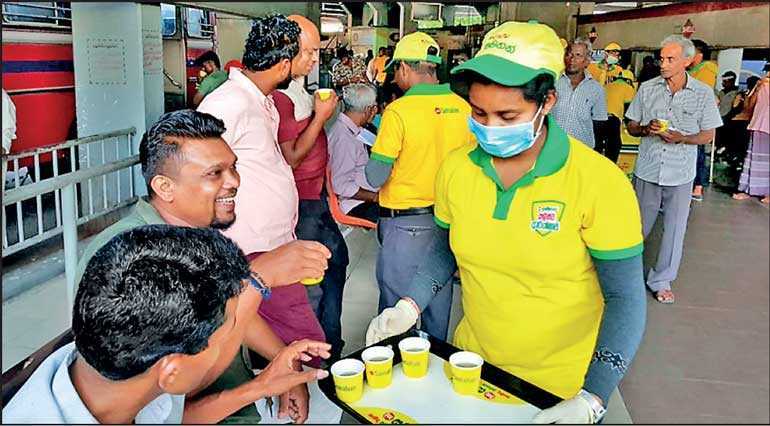 In a bid to provide relief from common cold and catarrh related symptoms to thousands of commuters who travel back home from Colombo for the New Year season, Link Samahan launched a CSR campaign titled, ‘Samahan Avurudu Sangrahaya’ to provide freshly prepared cups of Samahan herbal drinks at the central bus station in Pettah. The campaign took place daily between 9 a.m. until 7 p.m. from 5 to 12 April. The Company stationed two vehicles on either side of the Gunasekerapura entrance of the Central Bus Terminal to offer Samahan to commuters. One of the vehicles equip a large LED screen which displayed public services messages related to the New Year season as well as ‘Avurudu’ wishes while the other vehicle offered freshly prepared cups of samahan. In addition, a large trolley with a boiler capacitated to offer 400 cups of Samahan drink served commuters who were queuing inside the building. The Samahan herbal drink was prepared following stringent hygienic standards. In addition to being able to quench their thirst with a wholesome cup of Samahan 10 commuters won gift packs containing valuable provisions for a day of travel from Link Samahan. Those who drank cups of Samahan herbal drinks also received New Year almanacs (‘Lith’) from the Company. “This particular CSR campaign is part of a much larger communication campaign themed Samahan Kalinma Arakshawa’. The communication campaign revolves around the core message of early protection from 15 symptoms of common cold and catarrh with the help of Samahan herbal drinks. We want all Sri Lankans to enjoy a happy and healthy New Year,” commented Link Natural Products Marketing Manager Shanaka Fernando. Link Samahan herbal drink is a clinically proven, 100% natural, safe and effective preparation for relief from 15 common symptoms of cold and catarrh. Samahan has been widely used for over 23 years, both in Sri Lanka and overseas. Link Samahan is made from 14 natural herbs. Link Natural Products Ltd. is an ISO 9001, ISO 14001, HACCP and GMP certified company; Link Natural Products (LPN) was established in 1982. LNP offers an innovative range of over 200 Ayurvedic products.